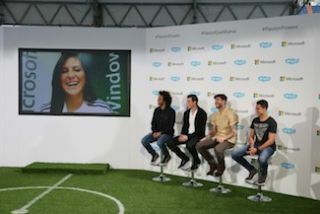 During a one-of-a-kind "digital sticker" initiative created to bring fans worldwide closer to their favorite team, Microsoft and Real Madrid used the Riedel Communications STX-200 professional Skype interface to facilitate a real-time Q&A session between Real Madrid fans and players. Licensed by Microsoft, the STX-200 is a stand-alone, broadcast-grade solution that leverages Skype to bring live content from remote participants directly to the on-air production. Licensed by Microsoft, the STX-200 is a stand-alone, broadcast-grade solution that leverages Skype to bring live content from remote participants directly to the on-air production. "The live Q&A session between Real Madrid fans and players during the 'Fan Sticker Album' event is a perfect example of using the power of Skype to create community," said Lars Höhmann, product manager of Skype and MediorNet at Riedel Communications. "Our STX-200 is a plug-and-play professional broadcast interface that meets the increasing need for broadcasters to engage their viewers in live programming using an all-in-one-box solution. I think we will see many more unique uses of this amazing technology." In contributing to the "Fan Sticker Album," thousands of participants from 118 countries—from Afghanistan to Zimbabwe—shared their passion for Real Madrid through the medium of photography. Within this digital photo album created by Microsoft, thousands of "stickers" featured a fan's photo, name, country, and length of time as a Real Madrid fan. A fan interacts with members of the team.For the real-time Q&A production that was streamed live, six STX-200s were connected to a WAN with their HD video outputs (audio embedded), then distributed via a MediorNet signal-transport backbone. Communications, including beltpacks and numerous keypanels, were facilitated with an Artist digital matrix. "This partnership is about so much more than a business partnership. It's an opportunity to truly put fans at the center of sport and revolutionize the way in which 'Madridistas' follow their team and share their passion for the club," said Orlando Ayala, Microsoft corporate vice president and chairman of emerging businesses, and an avid football fan. "More important is connecting fans with fans in new ways to enhance and extend their community."